The Islamic Republic of Pakistan is a country in southern Asia. It is bordered by Afghanistan, India, Iran, and the People's Republic of China. As of 2010, the population of Pakistan was estimated as being 169,580,000. 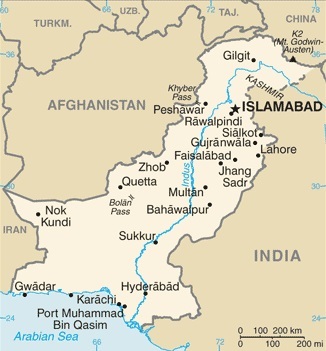 The country's capital is Islamabad, which, as of 2009, had an estimated population of 1,740.000. Pakistan's largest city is however Karachi, which is home to somewhere between 12 million and 18 million people. Pakistan is a land with a unique history, formed by migrating peoples who have left their footprint in its diverse cultures, languages, literature, food, dress, and folklore. The country is besieged by bad news, but despite the political turmoil the everyday life of its people is more stable, rich, and rewarding than the media headlines would lead you to believe. A myriad local festivals and celebrations and a vibrant cultural life go unremarked. Pakistan has the eighth-largest standing army in the world and is the only Muslim-majority nation to possess nuclear weapons, but few know that it is also the home of two unique schools of art. This complex nation consists of various ethnic groups, each with its own individual cultures and subcultures, but which are unified by the common values of hospitality, honor, and respect for elders. Pakistani society has extremes of wealth and poverty, and daily life for most people is full of difficulties, yet everyone knows how to cope with crises. Creative and adaptable, Pakistanis are among the most self-reliant people in the world, bouncing back after major catastrophes. Culture Smart! Pakistan takes you behind the headlines and introduces you to many of the country’s little-known traditions. It describes the vitally important cultural and historical background, shows you how modern Pakistanis live today, and offers crucial advice on what to expect and how to behave in different circumstances. This is an extraordinary country of enterprising, tough, and passionate people. Earn their trust and you will be rewarded many times over. Book by Amin, Mohamed, etc. Let us guide you on every step of your travels. From deciding when to go, to choosing what to see when you arrive, Insight Guide Pakistan is all you need to plan your trip and experience the best of Pakistan, with in-depth insider information on must-see, top attractions like Lahore Fort, Moenjo Daro, Hunza Valley, Lahore and Shah Jahan's Mosque, and hidden cultural gems like the Thar Desert. This book is ideal for travellers seeking immersive cultural experiences, from exploring the Salt Range, Badshahi Mosque and Bala Hisar to discovering the sites of the Silk Road.